1. Griffith Park Observatory: Check out one of the most gorgeous — and probably most famous — view of L.A. from the Griffith Park Observatory. Admission to the observatory and grounds is free! Therooftop deck is open until 10 p.m. Tuesday through Sunday. 2. Olvera Street: The oldest part of downtown Los Angeles (constructed in 1781), this historic community boasts a number of shops and restaurants featuring Mexican cuisine and crafts typical of old Mexico. This popular tourist area has a traditional Mexican-style plaza that often features live music and dancing. It's definitely worth taking a walk through, scouting out some souvenirs and grabbing a taquito with some friends. 3. 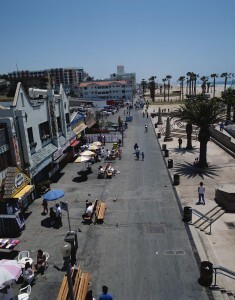 Venice Beach Boardwalk: When in L.A., you have to check out this eclectic neighborhood full of pedestrians, cyclers and skateboarders. An array of artsy shops, street vendors and performers line the promenade in this vibrant and fun-to-explore beachfront neighborhood. 4. Echo Park Lake: A great place to go to escape the L.A. traffic. Bring a picnic lunch, sit and relax on park benches, feed the ducks or wander the walking path. 5. Hollywood Walk of Fame: If you can't walk down the red carpet this trip, at least walk down the Walk of Fame and check out the 2,400 stars! Once per year, an average of 20 Hollywood stars are selected to receive a star (made of terrazzo and brass) on Hollywood Boulevard and Vine Street in Hollywood — a monument to their successes in entertainment. 6. Getty Center: One of the best parts of this fabulous museum is it's FREE. No tickets or reservations are required for general admission. The Getty Center has an impressive collection of American and European artwork and the building itself is a stunning work of architecture—with modern and unique elements, gorgeous gardens and an impressive view of the city. 7. Attend a TV Show Taping: Be a part of the audience and watch a TV show taping for free! Go to www.tvtickets.com to see what's available. You can get tickets on a first-come first-served basis up to 30 days in advance of the show date. 8. La Brea Tar Pits: Believe it or not, in the heart of downtown L.A., you can find pits of tar (asphaltum, or "brea" in Spanish) bubbling up from beneath the Earth's surface. In fact, this has been going on for about 40,000 years, revealing fossilized plants and animals from the last Ice Age (mammoths, birds and sabor-toothed tigers, to name a few), which are on display in the museum and laboratory. Admission is free on the first Tuesday of each month (excluding July and August), but on all other days, admission is $8 for university students with their university ID. 9. Eat Adventurously: Typhoon, a restaurant in Santa Monica, serves stir-fried Taiwanese crickets for $9. For a dollar more you could try a plate of frog legs, deep-fried Thai style with some cilantro sauce. Tasty. 10. Hollywood Forever Cemetery: See where the stars are buried. The Hollywood Forever Cemetery is the final resting place for dozens of Hollywood's founders and actors. Bring comfortable shoes to walk the grounds. Free maps are provided for self-guided tours.